A few days ago I talked for a while with Costa, an old fisherman from the working-class neighborhood of Dafundo, on the Lisbon Coast. He had some stories to tell – mostly dealing with the life of the fishermen in the old days and the hard times that never really went away. Separated from the beach by the railway line and the coastal road connecting Lisbon to the exquisite village of Cascais, the few remaining fishermen prefer to take their chance and risk being run over by a car or the frequent trains than walking all the way to the closest pedestrian crossing. I knew there had been accidents in the area, but had no idea if they were frequent. I asked Costa about it. He told me the story of Rui, ‘a son of the neighborhood.’ Rui is a machinist at CP, the company that explores and maintains the Portuguese railways, and works at the very same Lisbon-Cascais line his Dafundo friends cross all the time. ‘The first time he ran over someone,’ Costa said, ‘he couldn’t eat breakfast, lunch or dinner. The second time, he managed to eat dinner. The third time, he ate dinner and lunch.’ Costa became silent. There really was no need to go on. Today, a train coming from Cascais had problems on one of its carriage’s wheels while passing in front of Dafundo. I’ve been told later by Euclides, whose father rans a tavern on the roadside, that the train passed by releasing sparks and smoke. The operator managed to reduce the train’s speed, but couldn’t avoid the derail of one of the carriages. 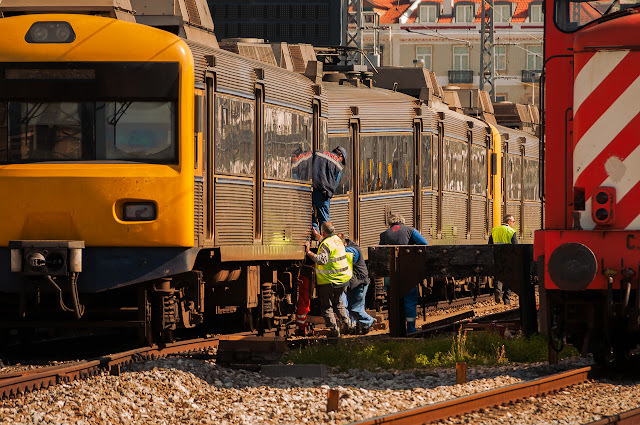 The accident must have caused damage to a switch, for another train, though warned and following the first one at low speed, had half of its carriages sent to another line. As I took some shots of the rescue team trying to remove the derailed carriage, I couldn’t help but thinking that at least today Rui would have all his meals.